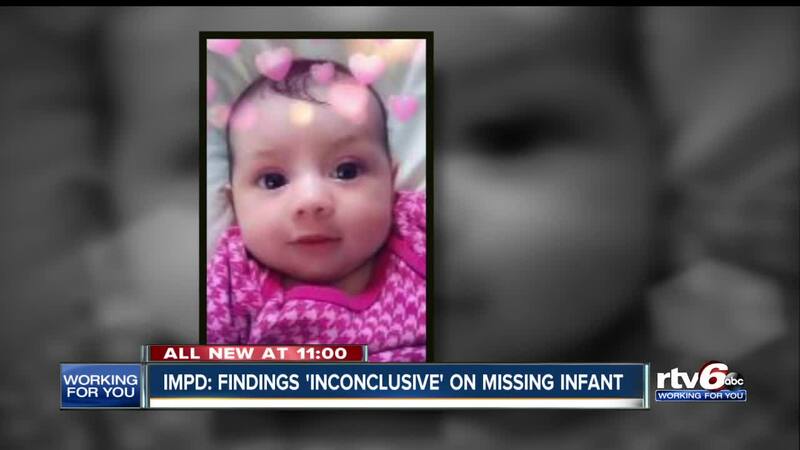 IMPD: Findings 'inconclusive' on missing infant. INDIANAPOLIS —The Indianapolis Metropolitan Police Department has canceled the Silver Alert for missing 8-month-old, Amiah Robertson. "I thought they'd find her in the river," Nicholas Price, Amiah's uncle, said. "I guess they didn't. I just want her home." Price watched from behind the yellow tape as the scene unfolded Wednesday. Amiah is his sister's baby. Price said he had not been communicating with his sister and that they are not especially close - but he wants to know what's going on. The investigation led police to West McCarty Street by Big Eagle Creek. "They came out here to follow up and discovered items that could possibly be related to the case," IMPD Sgt. Jim Gillespie said. "However that is not conclusive at this point in time." Amiah was reported missing last Saturday. "As time continues, the more difficult it becomes but the one thing that cannot be extinguished is hope. We have to remain hopeful that we will see her again," Sgt. Gillespie said. Police have warned the public not to spread rumors or speculation online. "Our detectives monitor social media, and they have to follow up on every single one of those leads," Sgt. Gillespie said. False leads, according to Sgt. Gillespie, can take resources away from what could be relevant tips in the case. Official updates with true and accurate information will come directly from the police.